With Fr. John Michael Hanvey in Preston. Well, any self-respecting Film Studies teacher simply has to go and see those films that are being acclaimed by the critics and are up for awards, if only to better inform his/her students and perhaps encourage them to see the film in question. So, off I went to see what all the fuss was about. 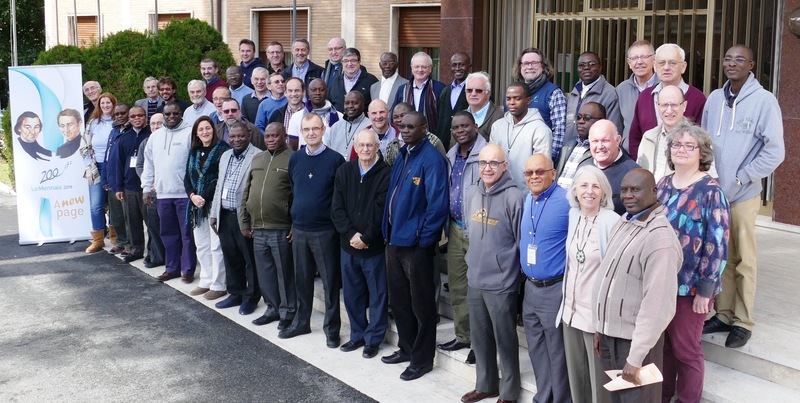 During the month of March I attended our General Chapter in Rome (nearly four weeks long) and it was a wonderfully positive, fraternal, hope-filled experience. Like with many congregations, our worldwide profile is shifting towards a "southern hemisphere" emphasis, but that does not mean there isn't life left in the north. Quite the opposite, in fact. "It's life, Jim, but not as we know it!!" We are responding to Pope Francis' call to "go to the peripheries" seeking ways to serve the poorest, most disadvantaged, most vulnerable young people, looking to respond to the needs of today's youth in the way that our Founders did 200 years ago (yes, we've got anniversary celebrations coming up). I sent the below message to my teaching colleagues in school the evening, braced as we are for the arrival of “those-who-shall-not-be-named” (i.e. OFSTED, national school inspectors) sometime between now and Easter. For those of you who live outside of Britain their job is to monitor and ensure high standards in all schools… the problem is that they keep moving the goalposts. Anyway, enough of that. Here’s what I said:I think that the attached video teaching is for us right now, to help us not lose sight of who we are and why we are here in a Catholic school. It's too late for the weekend just gone, but try to take on board it's message of "wasting time for God" over the coming weeks, despite the pressures that we are all under.